Acrobat Monkey Wooden Squeeze Toy is a classic wooden toy which has entertained for generations and dates back to the 1800s. 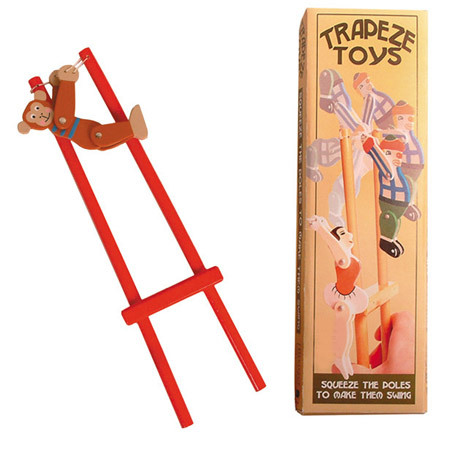 Sometimes called a Tumbling Toy, Flip Jack, or Acrobat String Toy this traditional wooden toy works by squeezing the bottom of the sticks toward each other. This makes the top of the sticks move outward and the little acrobat swing around. A wonderful toy and when you've had some practice you can make him stop at the top and do all sorts of tricks. Material: Wood childsafe paint, string. We like this because: "A fascinating toy that many will remember from their childhood. " Just want to say thank you so much for your excellent and speedy service. I received my order today and I am very happy with everything especially the service of My Wooden Toys.